Do you have a feeding philosophy? What’s your feeding style? These are not the most common topics in parenting discussions. We’re often too busy talking breast and bottle, baby led weaning or purees, organic or conventional, and how to get our kids to eat more vegetables. But the question of feeding style, I believe, matters more to children than any of these oft-discussed topics. 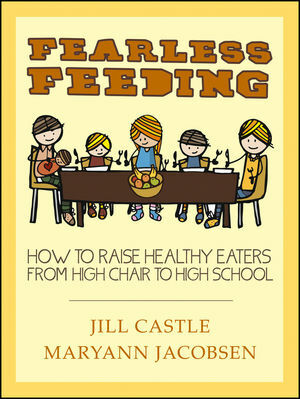 I am really pleased to have a new book on my shelf that covers the HOW and WHY of feeding children just as well as it covers WHAT to feed: Fearless Feeding: How to Raise Healthy Eaters from High Chair to High School, by Jill Castle and Maryann Jacobsen. 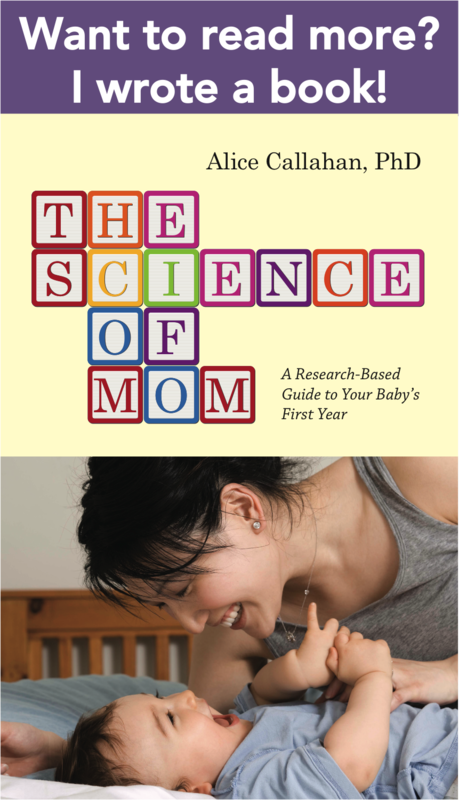 Both authors are registered dieticians, mothers, and bloggers. They take a long-term view on feeding – that we shouldn’t just be concerned with what our kids are eating today, but also about teaching kids to eat well for a lifetime. We’ll complete BabyC’s series of veggie recipes (see kale and carrots for more) this week with my favorite – a roasted beet and broccoli slaw. 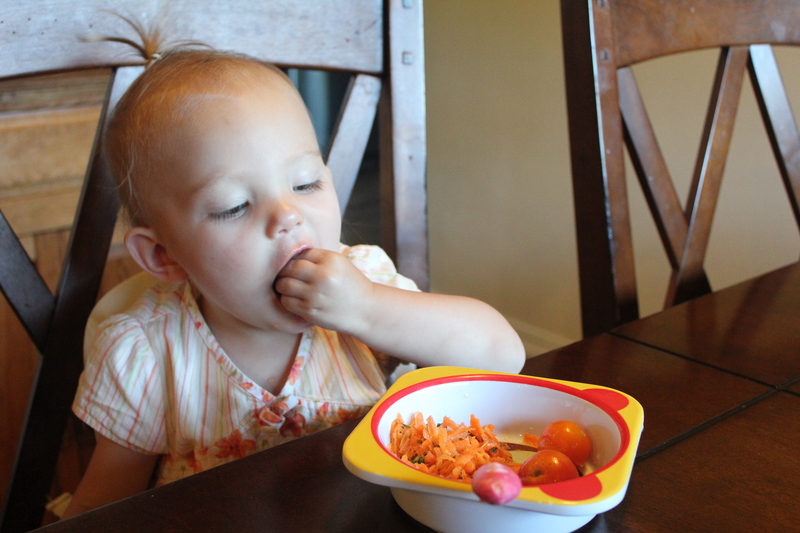 As promised, I’m sharing a few of BabyC’s current favorite veggie recipes this week. We talked kale chips on Monday, and today we’re on to carrots. 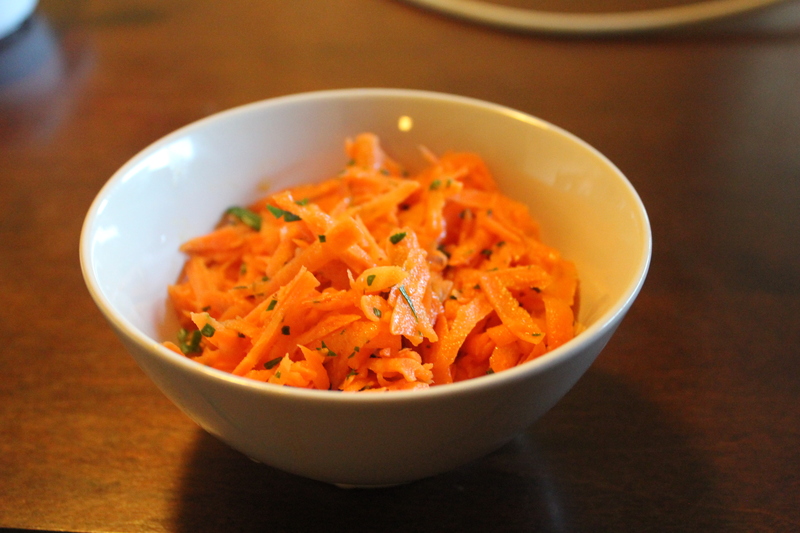 Karen Le Billon, author of French Kids Eat Everything, posted a French version of this grated carrot salad recipe on her blog a couple of weeks ago. I still haven’t gotten around to reading more than the first chapter (which she’s giving away for free on her blog and which I thought was fabulous) of her book, but I follow her blog with interest. If there’s one area that French parents really are superior to American parents, it is in how they feed their kids. Mix dressing by combining olive oil, juices, mustard, and salt. Grate carrots as finely as possible. Mix carrots, dressing, and parsley. Serve slightly chilled or at room temperature. I did not pay close enough attention to Karen’s directions when I made this, and I just used the regular large grate side of my box grater for the carrots. Karen says that the salad is best when the carrots are grated very finely, so I will try a smaller grate next time around. Regardless, BabyC loved this salad and ate it by the handful. I have also had good luck with grated carrots mixed with raisins, sunflower seeds, and whatever prepared vinaigrette I have in the fridge. After months of great skepticism of vegetables, particularly those that are green, BabyC has recently started to be a little more adventurous at mealtime. I think there are a few things going on. For one, we’re getting lots of fresh-from-the-farm veggies from our CSA, and fresh veggies really do taste better. I also think that our no-pressure, child-led yet adult-structured attitude about toddler feeding is starting to pay off. Finally, BabyC may be going through a growth spurt, as she just seems more interested in food in general these days. I know that kale chips have been all the rage of the food blogosphere for a few years now, but I had to include them here. This is pretty much the only way that I’ve seen BabyC eat dark leafy greens, and Husband and I love them, too. If you haven’t tried kale chips yet, now is the time. 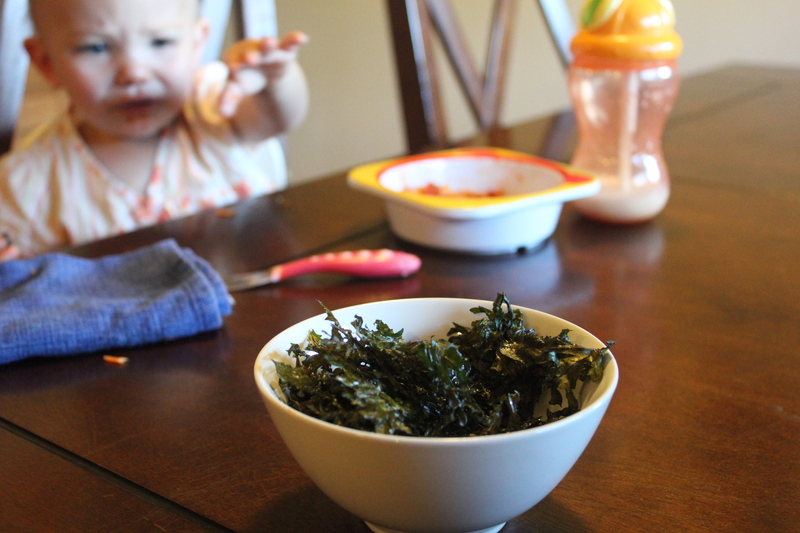 Yes, that is my child crying out for kale chips. And yes, I love this photo. How do you make pumpkin bread without pumpkin? Try using roasted winter squash instead. (Yes, I am aware that pumpkin is a squash, but you know what I mean.) Sure, you can call it squash bread, but that might confuse people. Just call it the best pumpkin bread ever. I made a double recipe of this bread twice last week. Yes, four loaves of “pumpkin” bread were consumed by my family and friends in just a few short days.The first time around, I gave a loaf away to friends and kept one for us to eat. About 24 hours later, I realized that BabyC and I had together eaten all but one slice of our loaf. Husband, who had been coming and going from work a lot, hadn’t even had a chance to try it! I felt obligated to make another couple of loaves so he could at least have a fair shot at it. I tried this recipe with two types of large winter squash: an ambercup and a kabocha (see here for an illustrated guide to winter squashes). 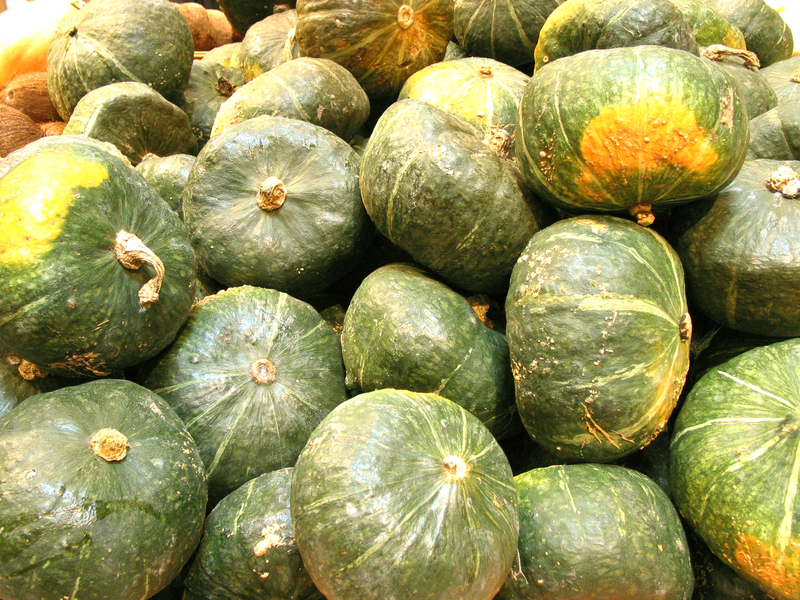 The ambercup squash had been sitting in our garage since November, when it came with one of our last CSA shares. It looks similar to a pumpkin but is brighter orange and has a slightly rough skin. It had kept beautifully in those cool temperatures, and the bread was perfect. The kabocha, purchased from my local grocery store, was equally good. I haven’t posted any recipes lately, so today I thought I would share 3 winter recipes. All of these recipes feature seasonal produce grown locally here in Oregon and maybe where you’re from, too! All of them are simple and comforting. In the first two recipes, winter vegetables are the stars. Both are a great way to work more winter vegetables into your kids’ meals. And as you know, I’m a big fan of vegetables. The pile of winter squash that we had held over from our fall harvest CSA share inspired this recipe. We were still working on eating up all the winter squash and root vegetables for several weeks after the CSA pickup ended, which was nice. This recipe used a couple of those squash, as well as being a very effective way to clean out our fridge. I looked at a few recipes online to get an idea of proportions for the filling, but in the end I just winged it, and it turned out great. Both Husband and BabyC enjoyed this dish, too. I created this recipe to solve a breakfast dilemma. You may be familiar with this scenario: Your child(ren) got you out of bed before you were ready, and you are groggy. You would like to sit and sip a cup of coffee before you start the day, but she is frantically making the “food” sign at you, and you have to respect her efforts at communicating her needs to you without whining. You need something fast and preferably healthy to appease the hungry toddler. As a nutritionist with an increasingly picky eater for a child (I have been assured that this is totally normal), I also worry that my child is not getting enough iron or fiber, both nutrients that are often lacking in toddler diets. I like to start the day with something that provides a nice portion of BabyC’s requirement for both of these nutrients, so that if all she eats is cheese for the rest of the day, I know we made an honest effort. Fortified oatmeal is a nice way to iron (and a little fiber), but BabyC will not be fed with a spoon and is only just starting to make some efforts at feeding herself with a spoon. 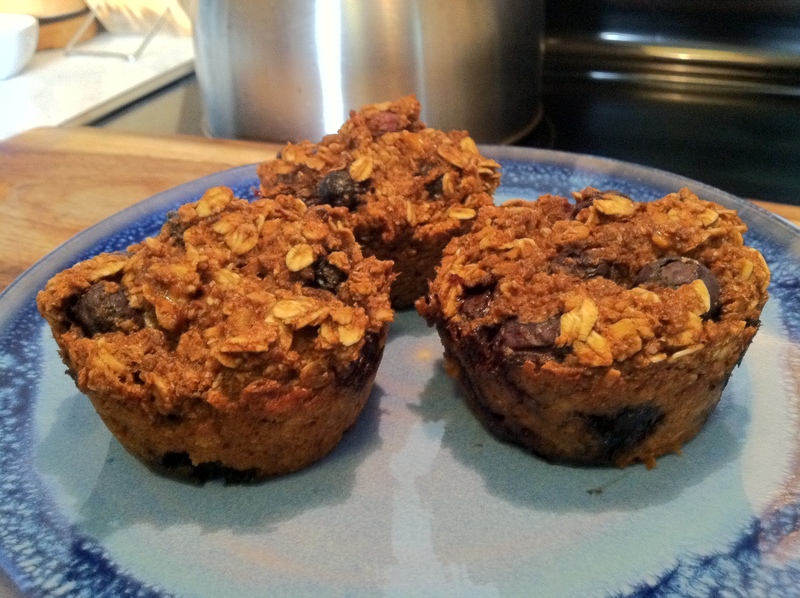 Enter… the baked oatmeal muffin. Remember all those veggies we got in our CSA box last week? I am proud to say that by Friday afternoon, when BabyC and I headed out to pick up this week’s share, our fridge was empty. Yup, we managed to eat just about all of last week’s share. Only a few radishes and half a carrot remained, plus the Delicata squash that I was intentionally holding over since it should keep. I tried a few new recipes in my efforts to include the bounty in our meals. 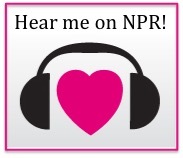 I rely heavily on Mark Bittman’s How to Cook Everything, especially for working with veggies that are new to me. His book has an alphabetized vegetable section with guidelines on storing and preparing each one, complete with recipe suggestions. His recipes are simple and highlight the flavors of the vegetables. To be honest, I’m not always blown away by the results, but I like the simplicity of this book and have found it to be a good place to start. We were members of the Tucson CSA for several years. It was great. We loved getting fresh, local, sustainably-raised veggies. Still, I often complained that I didn’t know what to do with all of the greens, and when work and life got hectic, I admit that sometimes things would get mushy in the veggie drawer and they would get sacrificed to the compost before I figured out what to do with them. When we moved to Eugene, we decided we’d try shopping at the Farmer’s Market for the summer. Eugene has an incredible market, one of the best I’ve ever seen (and I’ve lived in Davis, CA, and Ithaca, NY, so I know a good market when I see one). But unfortunately, we only made it to the farmer’s market a handful of times. I don’t have a really good excuse, but going required loading up the baby in the car during the short window between naps, finding parking, and navigating a stroller through the masses of market goers. And the market was also really overwhelming. I never knew where to start. 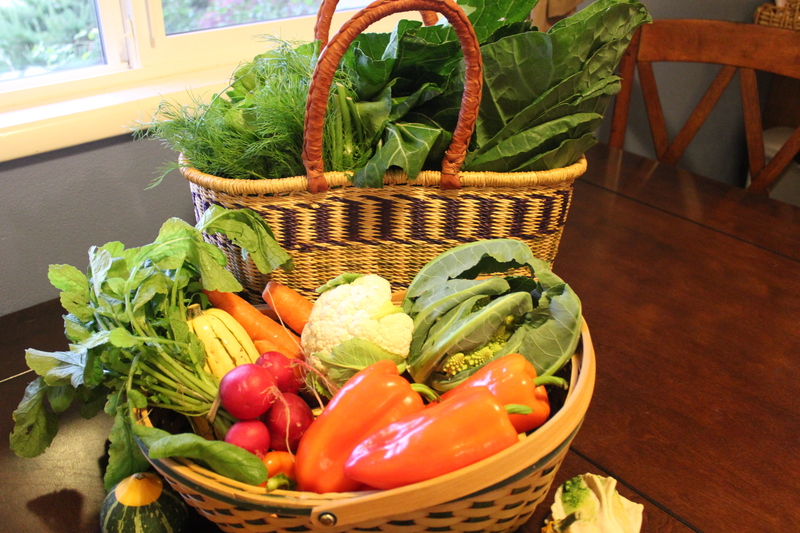 So, for the fall season, we joined the Winter Green Farm CSA. Our first veggie pickup was yesterday, and it is amazing.